To me, it is never too late to set goals. I am motived when I have something to work towards. It’s also an easy way to accomplish those New Year resolutions. You can break down those long-term goals into simple tasks (aka short-term goals), to aid that bigger goal. Setting these monthly goals can also bring clarity and may produce results faster than you normal. 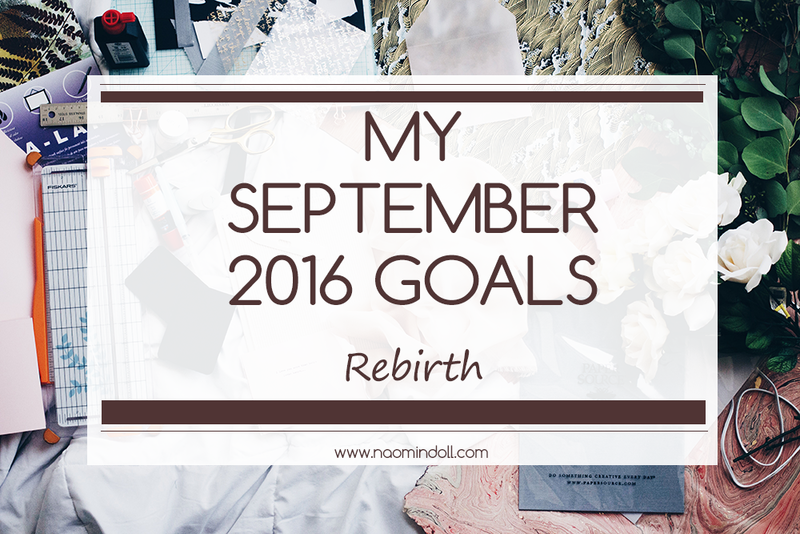 As I seek to accomplish this month’s goals, I hope that you may achieve yours as well. If you wish, you can share some of your goals in the comment section below. For me, the majority of summer was very hectic. The majority of summer was so hectic for me. I spent most of the season preparing for the local pop culture convention, AnimeKon Expo. Not only was I cosplaying three characters, but I was also selling my handcrafted, crochet goods. It was the first time I offered to have my goods sold and it was done through my friend’s stall. So June, July and August was spent crocheting and making my costume. Consequently my room is currently a big, heaping mess of materials, more or less. So with this month, I’m looking to finally go through my room and separate everything into ‘need’ and ‘don’t need’. This would not only free up workspace, but also motivate me and boost my mood. Trust me, you start your day differently depending on the surroundings that you wake up in. For the convention, I sat down and made 50 beanies and 10 amigurumi relating to various anime, comic books and video games. Of the items not sold, I was left back with 2 hats and 2 amigurumi. It was an absolute hit guys. Actually I was shocked, not realising that my handmade items would be so well received. As a result of that, I decided to take the plunge and start an online store. For years, this is something that I wanted to do. However doubt and every excuse under the sun was stopping. I didn’t know where to start, I didn’t know what I wanted to sell. I was more or less clueless. All of that has changed now, with doubt taking a backseat to my excitement. At the time of this post, I have already decided on a store name, take pictures of the stock and started looking at business logos. I just need to put it all together and hit that launch button. And when I do launch, you all will be the first to know. I’ve been cosplaying for 5 years now and this is the first year I’ve made an entire costume from scratch by myself. Believe it or not. Don’t know what cosplay is? Well it is the act of dressing up as characters from your favourite pop culture media like comics or video games. It’s honestly really fun and definitely recommend you try it at least once. Now I believe you don’t need to make your costumes when you cosplay. You can buy everything from the wig on your head to the boots on your feet and would still be considered a cosplayer. But for me, there’s a certain level of pride and warm feelings you get when you make your own cosplay. That is what I have pushed me to learn to sew. Like many cosplayers, I’m going to be more or less self-taught, using tutorials online and asking my mother for help. I’ve already bought a new sewing machine so I’ve set the gears in motion. Before the year is out, I hope to cosplay at least 2 characters and make one full cosplay. When I started blogging back in 2011, I started off as a Japanese fashion blog. If you go through earlier parts of this blog, you can still see posts on those topics. Even with my expanding interests, I’ve always made sure to not stray far from J-fashion. With the decluttering of my room, I hope to bring back more girly, J-fashion elements to my closet. Likewise I hope to do more J-fashion and Japanese culture posts. Despite having a journal, I’ve never sat down and planned out a calendar for myself. “Planning out every inch of your life is no fun,” and that is true, it’s not. But what a calendar does, is give you a general outline of the things you hope to accomplish for the day. With mine, I hope to make one where I can dedicate time to crocheting, sewing and blogging. Therefore, not running myself ragged trying to do everything at once. That way I have a routine set of tasks that I accomplish of Mondays, another set that I accomplish on Wednesdays, etc. Going further into routines, are morning routines. How you start your morning can impact how the rest of your day may go. From what you eat, to the first thing you do when you wake up. All of these are important. And quite frankly it’s something that I’ve never given much thought to until recently. When I have a solid daily and morning routine going for me, I hope to share it with you all. These are basically what I will be focusing on for the month of September. I see them as stepping stones to my larger, long-term goals and completing my New Year Resolution. Along with these, I hope to get back into blogging regular. Tell me what you think in the comments below. Do you see benefits in setting short-term goals? What are some of your goals for the month? Have you ticked any off your list as of yet? Of course it isn’t too late to start goals. 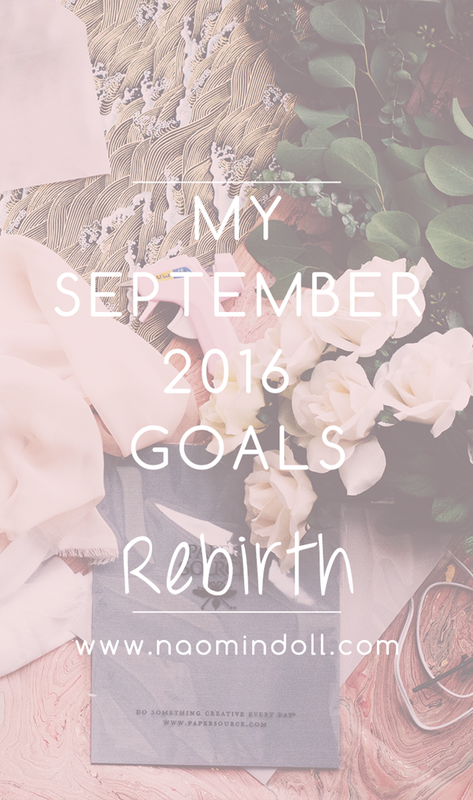 I like to do a reset at the beginning of the month and just decided to start blogging about them (it’s here if you’re interested, http://www.thirty30courtney.com/blog/september2016goals ). I have learned I have to be completely intentional with my planning for the blog and I use the Day Designer planner which is my biggest lifesaver. Between work, my current blog, and the next project in mind, it keeps me in order. Be sure to leave a checkin later about how your month went! Best of luck. I just made Sept. goals too, I know that January is the start of the new year but fall seems like the logical time to get back to work and back to setting goals! These are great goals – I love reading other people’s goals as they often inspire me with my own. Good luck on achieving yours!